Best Plumbing of Denver is pleased to offer a full range of plumbing services to our residential and commercial customers throughout the Denver Metro Area. We do it all, from drain cleaning to water and sewer line replacement. We're on call 24/7 for emergency repairs, and look forward to being your go-to Denver plumber! 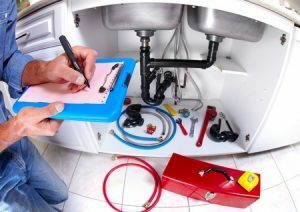 Best Plumbing of Denver is your local plumbing repair specialist! Our plumbers have been proudly serving Denver, CO and Westminster, CO for 28 years. We love our beautiful state of Colorado, and are honored to have worked with so many homeowners, business owners, and civil organizations in our neighborhoods. The biggest compliment that we can receive is when our many happy customers refer their friends, family, and colleagues to us. Are you looking for a certified, professional plumber who will listen to your needs and respond quickly? Call us today at (720) 363-2907 to speak to our Master Plumber to schedule plumbing repair or discuss your next plumbing project for your Westminster, CO area home or business! We offer a full range of residential and commercial plumbing services. Our skilled plumbers can handle repairs and projects both big and small. From drain cleaning to sewer and waterline replacement, we consistently deliver premium work and excellent customer service. Major excavation needed to repair or replace a damaged waterline? We’ll power up our excavator and head on over! Sewer backing up and causing damage? That’s no problem for us to fix! Drains clogged and driving you nuts? We can safely clear those out for you! Even if you don’t know exactly what you need, but you suspect a leak or just simply need a quote for your water or sewer line replacement, contact us! We love working with customers in Denver, CO and Westminster, CO to help them get their home or commercial property into shape. Plumbing is a critical component of a well-operating structure, and we deliver quality workmanship no matter the scale of work needed. Our owner, Dan Thompson, is a certified Master Plumber (#185281), and regularly takes calls from our valuable customers. His oversight is key on every job that we do, and this level of expertise allows us to handle large and small scale projects with professionalism and skill. Learn more about us here. 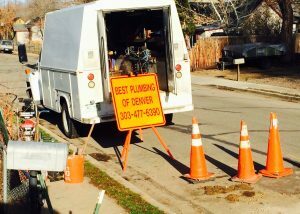 Because Best Plumbing of Denver understands full well that burst pipes rarely occur during business hours, and that discovering a sewer backup into your home generally happens as you’re expecting company for the weekend, we are available 24/7 for you. As fellow Coloradans, we’re glad to offer emergency plumbing service to our local community. Especially during freezing winters, unexpected plumbing issues can wreck havoc on your property and your plans. If the worst occurs, don’t hesitate to call us, night or day, at (720) 363-2907. We’re here for you! We know that calling a plumber is usually the last thing you want to do. We’re inherently thought of only when there’s a problem, and while it’s a tough gig, we’re happy to do it. Why? Because we enjoy helping you, our Denver, CO area neighbors. 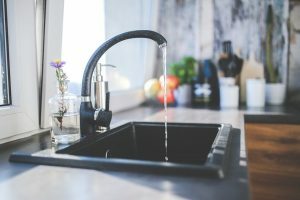 Most homeowners and business owners cringe at the thought of pricey plumbing service calls, and some will even delay making the call by attempting to mask the issue versus a proper repair. This can lead to more damage and more costly repairs down the road, and you deserve to have the issue fixed right! Pick up the phone and call our highly-trained team at (720) 363-2907. We’ll treat you with respect and integrity, and will make the right fix, using the right materials via the right technique. Done and done! We also offer emergency plumbing services 24/7, and specialize in water and sewer line replacement. Call us at (720) 363-2907 to speak to a professional plumber, and we’ll quickly help you address whatever plumbing issue you’re facing. It’s never fun to be facing leaks, damage, and repairs, but we promise to make the process as smooth and straight-forward as possible so that you can get the whole issue behind you. We look forward to speaking with you! Are sluggish drains driving you nuts? Are you waiting around to finish dishes or racing the rising water as you brush your teeth? It sounds like it’s time for a proper, professional drain cleaning! Most over-the-counter drain cleaners don’t get to the root of the problem because they’re designed to be general treatment, and temporary at best. After years of hair, grease, food, debris and other undesirable materials making their way through your water and sewer lines, it’s just a matter of time before the pipes are clogged and drainage suffers. Best Plumbing of Denver offers simple, efficient drain cleaning services to not only treat the issue, but also to actually identify the problem. General build up can certainly cause slow drainage over time, but you may be dealing with a more substantial clog or even an issue with the lines themselves that won’t improve by simply masking the symptoms. We’ll use mechanical and/or hydro-techniques to clear the lines completely, and won’t leave the site until we ensure that drainage is occurring quickly and efficiently. The water pressure has seemingly disappeared. You hear running water long after the faucet has been shut off. Or even worse, you see water quickly puddling in an area where that much water most certainly should not be. You, my friend, may be dealing with a burst pipe or leak. They’re all too common here in the Denver Metro Area, especially as freezing temperatures challenge aged or damaged piping. 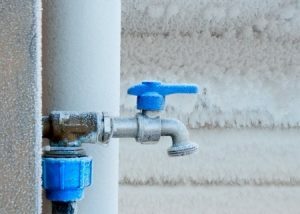 As pipes expand to accommodate hot water running through the pipes, while ice and frost envelop the outside, pressure can build and even a small weak point undetectable to the untrained eye can result in a blow-out that sends water spewing all over the place. If you discover the unfortunate surprise of a water leak, don’t hesitate to call us at (720) 363-2907 for emergency burst pipe repairs. We will quickly send out one of our highly-trained plumbers to fix the issue, and walk you through how to prevent further damage in the interim. Updated on February 14, 2017 at 2:46 pm by Best Plumbing of Denver.